The Delta T™ is designed to simulate host conditions on the stage of a microscope and provide an optimal optical environment for microscopy. This two-step system enables cells to be plated and observed without having to transfer them to another structure for imaging. The basic system components are, the Controller, a Stage Adapter, and Dishes. There are a variety of accessories for the Delta T™ that enable it to be used with nearly any specimen type. 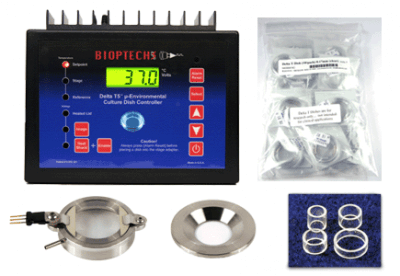 The Bioptechs Delta T™ Culture Dish System is the only culture dish that provides heat to the contents of the dish without heating the stage of the microscope. It uses number 1.5 thickness cover glass bottomed dishes that have an electrically conductive, optically transparent coating of ITO on the underside. The coating is electrically powered to directly warm the contents of the dish. 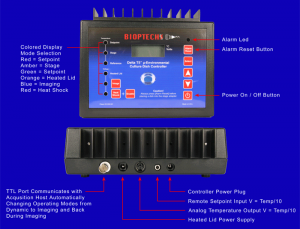 This is an exclusive technology to Bioptechs and provides features and capabilities no other system can match. 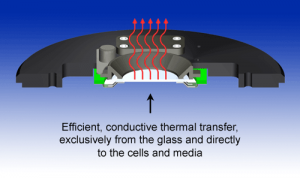 An intelligent feedback loop passes an electrical current through a thin-film coating on the underside surface of the glass substrate on which the cells are grown. 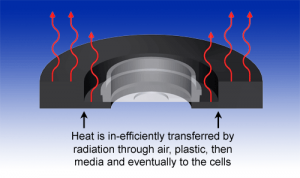 Heat is applied directly to the cells without the inefficiencies associated with peripheral heating by traditional peripherally heated culture dish warmers. Bioptechs exclusively offers opaque culture dishes which eliminates the unwanted ambient light background for fluorescence imaging. The controller features a real-time temperature display and fast learning curve to compensate for cooling due to surface evaporation while responding to temperature changes due to perfusion. There is also an alarmed protection circuit to safeguard the cells and an internal reference for the user adjustable calibration. The standard controller has a temperature range of ambient to 50° C. Extended ranges are available upon request. Delta T™ dishes have 35mm O.D. and a 23mm central aperture. The peripheral region of the dish is tapered to reduce the dead-volume and the height of the dish is 6mm to allow better access for micro-injection and micromanipulation. The dishes are a hybrid of polystyrene plastic and Desag 263 glass. 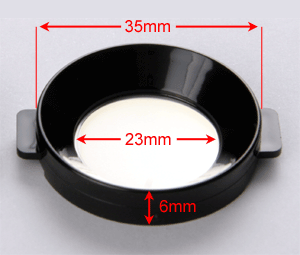 The outer structure of the dish is available in opaque black or clear and come with a clear 0.5mm or No. 1.5 glass coverslip bottom bonded to it. The dishes are also available in a plain glass unheated version.It accommodates a wide variety of specimen types including adherent cells, suspended cells, tissue, and artificial membranes. This system is ideal for multi-user facilities or those that don’t need a flow cell but are undecided about what type of chamber system is required. The Delta T™ has an assortment of convenient accessories that expand its capabilities. The most often used accessories are the Heated Lid, Coverglass Lid, and Culture Cylinders. Short of needing a defined flow for perfusion, the Delta T™ is the most convenient, accurate, means of micro-environmental control for a microscope. The thermograph on the left shows the efficiency, accuracy and uniformity of the Delta T™ system. Notice the temperature of the stage adapter. It is nearly the same temperature as the room temperature background. The dotted oval shows where the edge of the stage adapter is in visible light. Only the specimen and media are heated. Power consumption is 0.9 watts because heat is only applied to the specimen area. There is no heat transmitted to the stage. Therefore, it remains “Z” axis stable. This is a sharp contrast to traditional peripheral heating methods (shown below right), and clearly superior. The thermograph above on the right indicates the disadvantage of peripheral heating. This is a thermal image of a 50mm culture dish in the center of a 100mm diameter uniformly heated, 3mm thick, aluminum plate with a 25 mm hole in the center. This image was acquired after 20 minutes of equilibration. Note the high temperatures of nearly 60° C, that it takes to reach 37° C in the specimen area. In this case heat that is not beneficial to the specimen is sunk into the stage causing Z-axis instability, not to mention the non-uniform temperature of the specimen area. Ideal for first time users and multi-user facilities. Bioptechs has combined the Delta T with the three most commonly used accessories to get you up and running as fast and trouble free as possible at a reduced price.The Bioptechs starter set will immediately give you the micro-environment base for your cells to start high end time lapse microscopy with the ease of disposable culture dishes, and the versatility to image a wide variety of cell and tissue cultures directly out of the box.